I just want to be a man who’s been to a concert with a girl in a red dress. 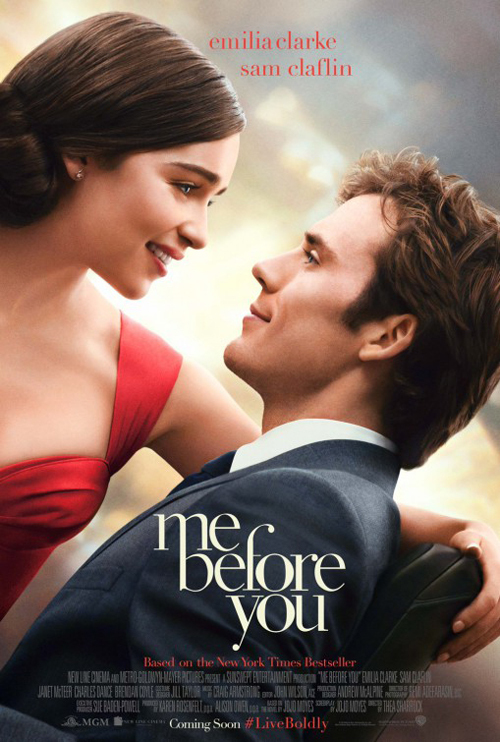 (SPOILERS) Me Before You makes for a surprisingly not insufferable tragi-romance, although that’s largely down to the winning performances of Emilia Clarke and Sam Claflin. An adaption of Jojo Moyles novel of the same name, by Moyles herself and directed by Thea Sharrock, this tale of a quadriplegic bent on going through with assisted suicide suffers from the combination of tackling difficult subject matter but making it accessible, with the result that it ends up being just another tearjerker. Part of the problem is that debut feature director Sharrock has diligently thumbed through the romcom 101 rule book for every single choice or decision. Enormous signs hang over each ringingly obvious heartbroken or affirmative musical cue that can be timed to turn up on the soundtrack every five minutes, most brazenly in requisite by-the-numbers montage sequences. Of the latter, the most insufferable finds Clarke’s Lou Clark, in a bid to produce a “reconsider your options” bucket list showing how liveable life is – look how well that worked out for Freeman and Nicholson – thumbing through brochures, books and the Internet for activities to distract Claflin’s Will Traynor from his suicide fixation. Obviously, grouchy Will (“I don’t do anything, Miss Clarke. I sit, and just about exist”) is going to be slowly warmed up by life-loving Lou, and before long he’s showing her subtitled films, trundling around and about, going to the races, to orchestral recitals, her birthday (much to the annoyance of her boyfriend, Matthew Lewis) and even the wedding of his ex, where the two admit their feelings for each other and promptly take a holiday in Mauritius. But alas, poor Lou discovers Will’s intentions have not changed, and he still wants to head for Switzerland. There’s been criticism that Me Before You romanticises and condones Will’s third act decision and is consequently irresponsible and insulting to all those who live with disabilities, don’t opt to “take the easy way out” and don’t see life as a terrible burden that can only be alleviated by ending it all. That’s a fair position to take if you see movies as morally obliged to advocate the correct and most positive viewpoint in every scenario. Otherwise, it’s ridiculous, and you should tell the story you’re inspired to tell, and trust your audience is mature enough to recognise that one character making the "wrong" decision is not necessarily an endorsement or recommendation to everyone in that situation. Really, it shouldn’t need saying, but it’s the common problem whenever something in the arts is tarred with the brush of responsibility to society as a whole, leapt upon by a media keen to blur the lines between fact and fiction. For my part, I didn’t take away that Will’s decision as noble or honourable (“I can’t be the kind of man who just accepts this, I don’t want you to miss all the things I can’t give you”), although more emotionally fragile audience members might see it that way. The problem with the movie is that, by its final reel, it has become so sodden with didactic, emotionally bowel-moving dirges, it eschews much resonance at all. Another sugar-coated Hollywood weepie, shamelessly manipulative and heartstring pulling, which eventually becomes a bit wearing. As noted, however, Claflin and Clarke who make this work as well as it does, and at times they’re so good you nearly forget that you’re being played like a violin. Particularly Clarke, who can come across as a bit wooden elsewhere (Game of Thrones, anyone? Mentioning Terminator: Genisys would be plain unfair) Also on hand are Charles Dance in a surprise nice guy dad role, Janet McTeer, who finds much more in Will’s mum than there is on the page, Jenna “Clara” Coleman as Lou’s sister and Joanna Lumley as a wise soul at a wedding. Steve Peacocke’s also hugely sympathetic as Nathan’s carer. Watching beautiful people die tragically but gorgeously (Love Story, Dying Young) is a Hollywood staple, and they rarely make particularly good movies, feeding on their intended audience’s most self-indulgent, sentimental impulses, so Me Before You’s kind of lucky that it’s as unobjectionable as it is.